This article is about the character. For the guest star, see José Canseco. José Canseco is a former baseball player and was one of the players in the Springfield Nuclear Power Plant softball team. Waylon Smithers, Jr. goes to visit him at a baseball card convention to ask him to come work at the Springfield Nuclear Power Plant so that he could join the softball team. 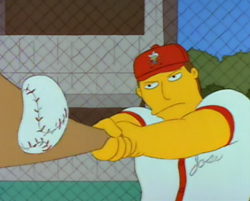 When Bart and Ralph were picking players for their softball team, Ralph picked José Canseco. He couldn't play in the last game because he came across a house fire, and rushed in to save a woman's baby who sent him in to save her cat, then her player piano and then more and more objects. After saving the woman's dryer, he placed it to the left of her washer and the woman told him the dryer goes on the right, so he placed it on the right after. Saving all those objects took a lot of time, and Canseco didn't make it to the game. He was one of the celebrities Homer saw going out of a laundrette. Modified on February 17, 2017, at 08:40.